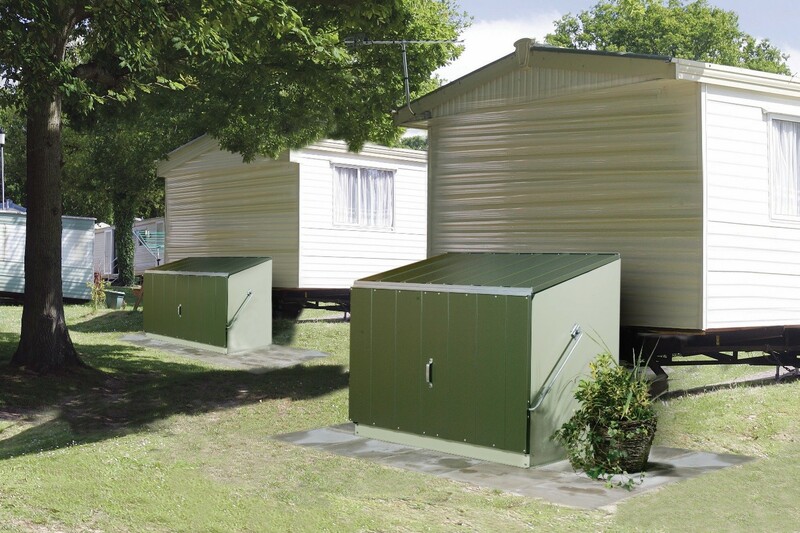 Mobile and Static Caravan Storage Options –Storage Units, Sheds or Undervan Boxes? You can never have enough storage space, the more you have the more you will purchase to fill it. Garages, outbuildings, lofts, basements and cupboards all fill up quickly, but what if you live in a mobile home or own one for holiday use and weekends away. If storage space is a problem in a house then image the fine tuning needed to manage storage when space is really at a premium. Where do you store bulky items? – it’s great to have a barbeque set for those long summer evenings outside, bicycles for exploring into the countryside, fishing rods to relax next to the local river or lake, outdoor chairs and tables; the list goes on. Luckily there is an extensive range of options available to suit every situation and budget, but which is the best and how do you decide? Firstly you need check the maximum storage space you are allowed on your site. For residential parks a 6’ x 8’ shed is usually accepted but for mobile home and static sites exterior storage space is generally restricted to approximately 2m x 1m. There are however a wide range of storage units to fit the bill, often called bunkers or boxes. These are available in all price ranges for varying qualities and security levels. Bad news for wooden and plastic storage! Wooden storage boxes are universally prohibited on caravan parks due to fire risks and plastic boxes are only accepted on very few parks, as well as being limited to where they can be sited (again due to fire risks and insurance requirements). The main disadvantage for wood or plastic storage solutions is they offer very limited protection from thieves; also these light weight products can easily become damaged (or simply blow away) when placed in areas subject to harsh weather (such as coastal mobile home / static parks). As the old saying goes “you get what you pay for” and this is very relevant to metal storage boxes and sheds. 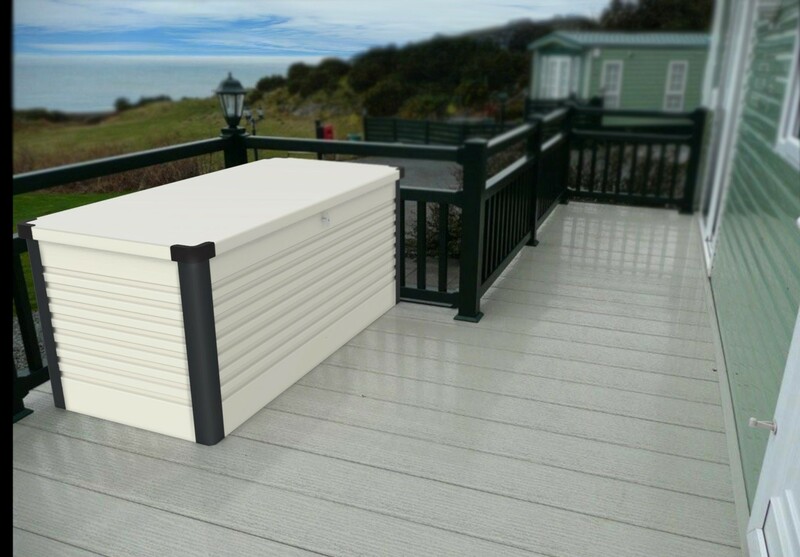 Cheap versions, often offered by DIY superstores, may be acceptable for storing some basic equipment in a garden location but they are simply not designed for salt water environments, and strong winds. Economy versions will rust quickly and offer very basic security – for our application they are false economy. However premium metal storage products are ideal, they are strong and secure; offering long guarantees (of up to 25 years) against corrosion – they are also fire resistant and generally available in larger sizes than plastic alternatives, so you can store bikes and fishing rods easily within. Undervan storage is an option too! Usually storage boxes are bolted down onto paving slabs or a concrete base at the side of the van; but what if you do not have the space to place one? Well, help is at hand again, in the form of under van storage boxes; these are typically riveted or welded oblong metal boxes which either sit on the concrete under the home or are physically attached to the chassis. The downside to undervan storage boxes is their relatively low height so only small items can be stored. 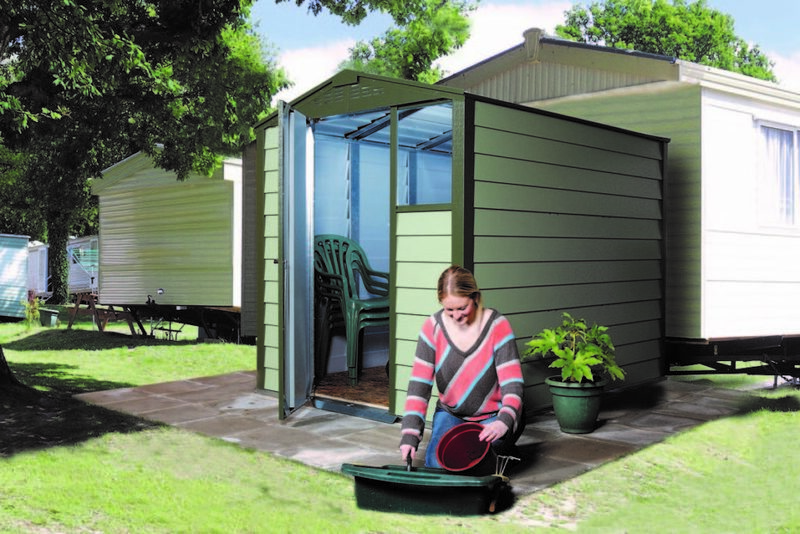 If you have more space available, live on a residential park or have permission from the site owners to use one, the ideal storage solution is a proper shed. A shed will be ideal for storing barbecues, bikes, garden furniture and a whole lot more besides. Consider again that a cheap metal shed will be much easier for thieves to get into and will not last anywhere near as long as higher quality products. A good quality metal shed will often be better long term value for money than cheaper alternatives which can be very flimsy and may rust quickly (especially in coastal locations). Whatever your choice of caravan storage, be it a storage box, undervan unit or a shed, it will usually be dictated to some degree by park rules and space restrictions. Just ensure that you purchase one large enough for your needs and the best quality that you can afford; this will ensure that you get the benefits of increased security, long service life and peace of mind. 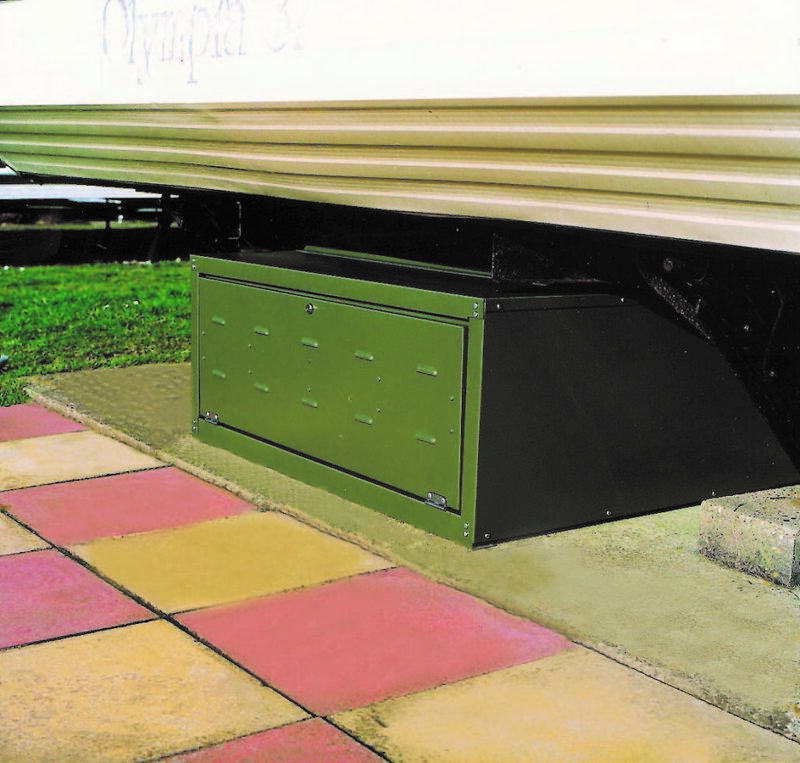 Static Caravan Storage options – Sheds, Units or Undervan Boxes? How can a rectangular static caravan look ship-shape?